FMH Conveyors is the leader in fluid truck loading and unloading solutions. FMH manufactures a complete range of custom engineered and designed conveyors for truck loading and unloading along with other applications for manufacturing, assembly, order fulfillment, and packaging operations. NestaFlex is a world renown brand throughout the material handling industry from retail store receiving, to DC shipping to packaging lines. It stands for superior design and functionality allowing for complete portability, expansion, contraction, and flexing into curves. Flexible gravity conveyors improve shipping, transportation and packaging applications. BestFlex is recognized throughout the world as the brand that designs systems to save time and labor, increase overall efficiencies in a wide range of truck loading, unloading and manual sortation applications. 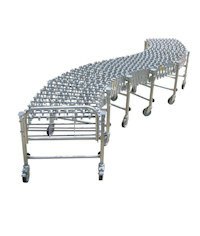 The BestFlex power flexible conveyors provide the same function and versatility as gravity, but with the benefit of powered rollers. BestReach is an established brand with strong equity in the marketplace. Rigid conveyor systems are the perfect solution that provide full reach all the way into the trailer from your permanent conveyor system with the highest level of ergonomic benefits and safety controls available in the industry. BestConnect is the newest brand in the FMH Conveyors portfolio. 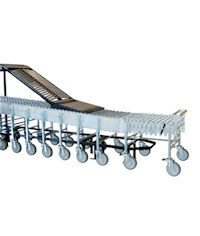 Initially designed for E-commerce, this product can be easily reconfigured to meet your current or future loading or unloading needs. The BestConnect is an innovative reconfigurable conveyor system that can easily link flexible, power and rigid products together to make loading easy and efficient. MaxxReach has a long history of supplying the material handling industry with high volume loading and unloading solutions. With it’s multiple options and diverse capabilities, operators are able to configure the equipment to best meet their specific needs. 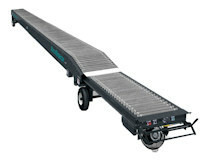 The MaxxReach telescopic conveyor provides the highest level of productivity for large volume applications.